If you love chai tea, you will LOVE the new Bhakti Chai products available at Safeway. 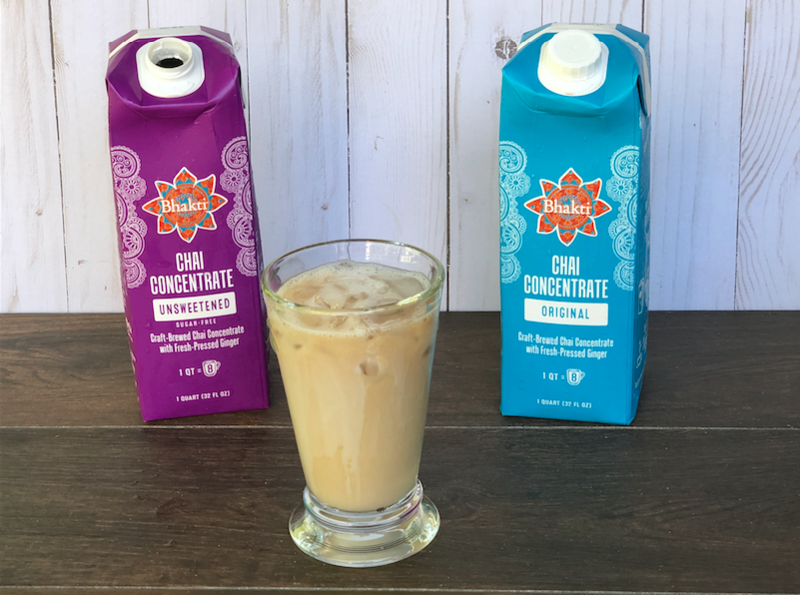 The Bhakti Chai iced beverages were developed by a Boulder mom after being inspired on a trip to India and falling in love with the delicious chai flavors she experienced while abroad. She came up with her own homemade chai recipes upon her return and they are now available in ready to drink bottles and concentrates at your local Safeway! 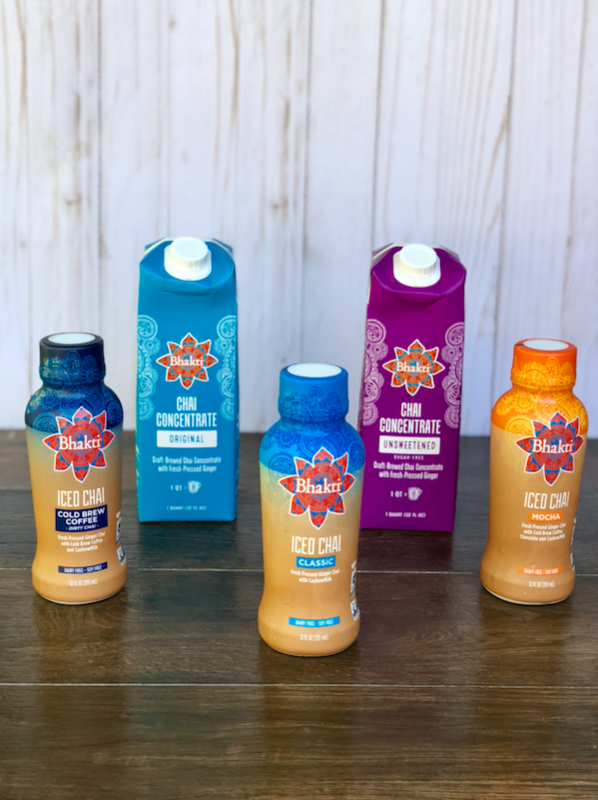 I’ve partnered with Bhakti Chai to review their products and encourage you to try the new iced chai’s that are now available at your local Safeway store. 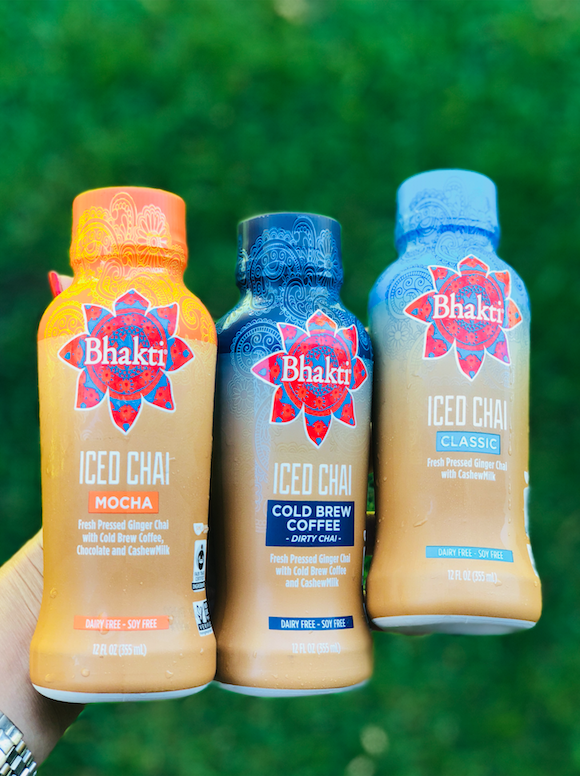 The Bhakti ready to drink chai’s are available in three delicious flavors including Classic Iced Chai, Mocha Iced Chai, and Cold Brew Coffee Dirty Chai. There are also two chai concentrates available that you can mix with water or milk to enjoy chai at home, in the office or on the go. These new vegan chai beverages are made with fresh pressed ginger chai and cashew milk, so they are dairy free and soy free, gluten free, and carrageenan free which is amazing because so often chai beverages are made with dairy and soy, so its fabulous to have a vegan alternative on the market! The cashew milk actually provides a little protein for the drinks, which is an added benefit. Bhakti Chai is made with fair trade sourced and organic ingredients, and use zero waste manufacturing and sustainable ingredients for the environment. The company is also a Certified B Corporation (A Benefit Corporation) to make sure they adhere to the strictest regulations in taking care of people and our planet. They also give back to nonprofits that support women and girls globally (gitagiving.org). It’s awesome that you can support this movement with your purchase of Bhakti Chai at Safeway! I picked up the three Bhakti Iced Chai flavors and the 2 concentrates from Safeway to sample and you can read my review below. I love chai and order chai lattes regularly at local coffee shops, so I’ve had many chai teas and lattes throughout the years. The Bhakti Chai flavor profile is unique from other chai blends and they are each very different from one another, and I absolutely love it! The classic flavor contains fresh pressed ginger chai with cashew milk. The flavor profile is warm spices like cardamom and masala with a ginger aftertaste. It’s absolutely delicious and refreshing. The perfect beverage for an afternoon pick me up when you want a slight caffeine jolt. The classic chai has half the caffeine as a regular cup of coffee, but it tastes better than coffee! It’s made with organic brewed black tea, chai spice blend, cashew milk, cane sugar and sea salt. It contains 186 calories, 4 grams of fat, 35 total carbs, 19 grams of sugar and 2 grams of protein. The cold brew coffee chai flavor contains fresh pressed ginger chai with cold brew coffee and cashew milk. You can’t really taste the coffee per say, but it adds a dimension of richness and added complexity to the iced chai that isn’t present in the classic iced chai. It is refreshing and you get a delicious blend of chai spices, coffee and ginger all at once. This blend contains as much caffeine as a regular cup of coffee. The cold brew flavor is made with organic cold brew coffee, organic brewed black tea, chai spice blend, cashew milk, organic ginger juice, cane sugar, and sea salt. It contains 196 calories, 4 grams of fat, 36 carbs, 19 sugars and 2 grams of protein. The Mocha Iced chai is contains fresh pressed ginger chai with cold brew coffee, chocolate and cashew milk. It has a delicious subtle chocolate flavor along with the coffee and chai flavors. The chai spices are present, but not as strong in this flavor. If you love chocolate and chai, it’s the beverage for you! It’s made with organic cold brew coffee, organic brewed black tea, chai spice blend, cashew milk, organic ginger juice, organic cocoa powder cane sugar, and sea salt. The mocha flavor contains 198 calories, 5 grams of fat, 37 total carbs, 19 grams of sugar and 3 grams of protein. Of the three flavors, the dirty spice cold brew coffee blend was my favorite. It has a super unique flavor profile and I just love that it has the same caffeine as a regular cup of coffee. The Bhakti Chai Concentrates had a completely different flavor profile than the ready to drink bottles. They have a potent ginger flavor and the chai spice profile is secondary in my opinion. Still delicious, but much stronger ginger flavor than I was accustomed to in a chai concentrate. I was thrilled that they have an unsweetened version because so many of the chai concentrates on market have a ton of sugar. You can drink the concentrates warm or cold. I made mine into a latte by adding equal parts almond milk and chai concentrate. I then frothed the milk and heated in the microwave for one minute. It was delicious! The Bahkti Chai Concentrates can be found in the refrigerated beverage aisle with the iced coffees and juices. It retails for $9.99 for a 32 oz container which is the equivalent to 8 cups of chai. 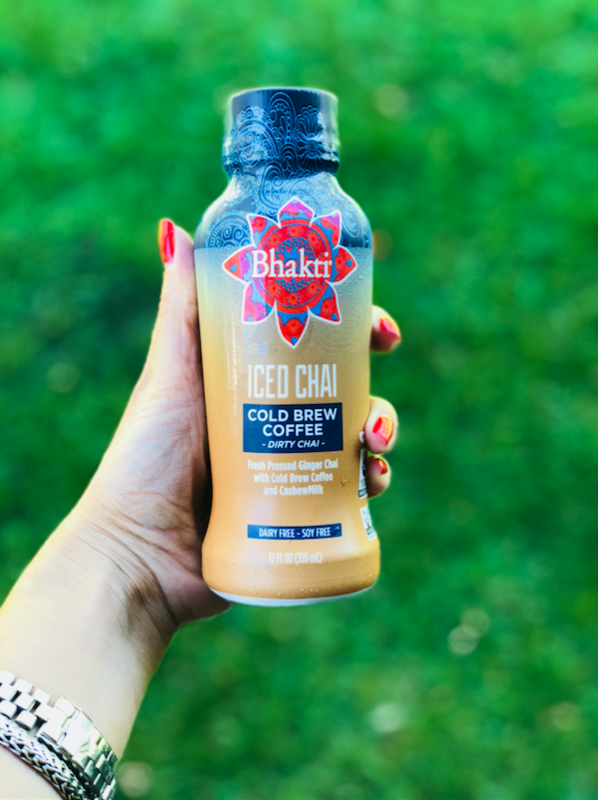 This is a sponsored post on behalf of Bhakti Chai to introduce you to their delicious iced chai beverages. We appreciate and encourage you to support the brands that make this site possible.